Chief executive Leeann Dempster has been leading the search for a new boss since Terry Butcher was axed on Tuesday in the wake of relegation to the Championship. Ian Murray, Stuart McCall, Owen Coyle, Danny Lennon and former Easter Road managers John Collins and Tony Mowbray are among those to have been linked with the position. The board will run the rule over the names who have applied over the last few days, as well as pinpointing candidates of their own choice. 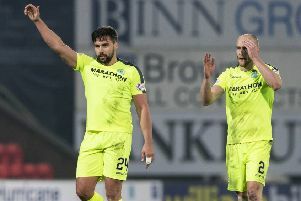 The Hibs players are due to return to pre-season training on Monday week, which increases the sense of urgency surrounding the appointment. Meanwhile, Dempster confirmed the appointment of George Craig to the newly-created role of Head of Football Operations. Craig, who led the review and restructure of the Scottish FA’s Club Academy Scotland elite player development programme, will oversee improvements to the Academy and player development programme, ensuring there is a structured pathway for players to develop from the Academy to the under 20s and first-team squads.